This is an old revision of this page, as edited by BilCat (talk | contribs) at 21:17, 17 December 2016 (Removed unsourced or improperly sourced pop culture items per WP:MILPOP - "'In popular culture' sections should be avoided unless the subject has had a well-cited and notable impact on popular culture."). The present address (URL) is a permanent link to this revision, which may differ significantly from the current revision. The Boeing 314 Clipper was a long-range flying boat produced by the Boeing Airplane Company between 1938 and 1941. One of the largest aircraft of the time, it used the massive wing of Boeing’s earlier XB-15 bomber prototype to achieve the range necessary for flights across the Atlantic and Pacific Oceans. Twelve Clippers were built; nine were brought into service for Pan Am and later transferred to the U.S. military. The remaining three were sold to British Overseas Airways Corporation (BOAC) by Pan Am and delivered in early 1941. (BOAC's 3 Short S.26 transoceanic flying-boats had been requisitioned by the RAF). The 314 used a series of heavy ribs and spars to create a robust fuselage and cantilevered wing, obviating the need for external drag-inducing struts to brace the wings. Boeing also incorporated Dornier-style sponsons into the hull structure. The sponsons, broad lateral extensions at the waterline on both sides of the hull, served several purposes: they provided a wide platform to stabilize the craft while floating on water, they acted as an entryway for passengers boarding the flying boat and they were shaped to contribute additional lift in flight. Passengers and their baggage were weighed, with each passenger allowed up to 77 pounds (35 kg) free baggage allowance (in the later 314 series) but then charged $3.25 per lb ($7.15/kg) for exceeding the limit. To fly the long ranges needed for trans-Pacific service, the 314 carried 4,246 US gallons (16,070 l; 3,536 imp gal) of gasoline. The later 314A model carried a further 1,200 US gallons (4,500 l; 1,000 imp gal). A capacity of 300 US gallons (1,100 l; 250 imp gal) of oil was required for operation of the radial engines. Pan Am's "Clippers" were built for "one-class" luxury air travel, a necessity given the long duration of transoceanic flights. The seats could be converted into 36 bunks for overnight accommodation; with a cruising speed of 188 miles per hour (303 km/h) (typically flights at maximum gross weight were flown at 155 miles per hour (249 km/h)) in 1940 Pan Am's schedule San Francisco to Honolulu was 19 hours. The 314s had a lounge and dining area, and the galleys were crewed by chefs from four-star hotels. Men and women were provided with separate dressing rooms, and white-coated stewards served five and six-course meals with gleaming silver service. The standard of luxury on Pan American's Boeing 314s has rarely been matched on heavier-than-air transport since then; they were a form of travel for the super-rich, priced at $675 return from New York to Southampton (comparable to a round trip aboard Concorde in 2003). 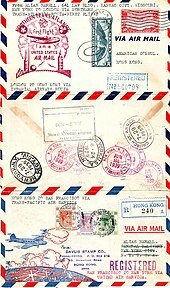 Most of the flights were transpacific, with a one-way ticket from San Francisco to Hong Kong via the "stepping-stone" islands posted at $760 (or $1,368 round-trip). The Pan Am Boeing 314 Clippers brought exotic destinations like the Far East within reach of air travelers and came to represent the romance of flight. Transatlantic flights to neutral Lisbon and Ireland continued after war broke out in Europe in September 1939 (and until 1945), but military passengers and cargoes necessarily got priority, and the service was more spartan. At the outbreak of the war in the Pacific, the Pacific Clipper was en route to New Zealand. Rather than risk flying back to Honolulu and being shot down by Japanese fighters, it was decided to fly west to New York. Starting on December 8, 1941 at Auckland, New Zealand, the Pacific Clipper covered over 31,500 miles (50,694 km) via such exotic locales as Surabaya, Karachi, Bahrain, Khartoum and Leopoldville. 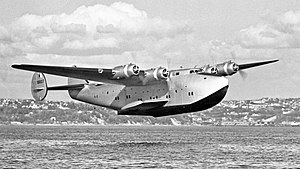 The Pacific Clipper landed at Pan American's LaGuardia Field seaplane base at 7:12 on the morning of January 6, 1942. The success of the six initial Clippers had led Pan Am to place an order for six improved 314A models to be delivered in 1941, with the goal of doubling the service on both Atlantic and Pacific routes. However, the fall of France in 1940 caused some doubt about whether the Atlantic service could continue; passenger numbers were already reduced due to the war, and if Spain or Portugal were to join the Axis, then the flights to Lisbon would be forced to stop. Pan Am began to consider reducing their order and, in August 1940, reached an agreement to sell three of the six under construction to the United Kingdom. 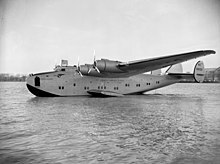 The aircraft were to be operated by the British Overseas Airways Corporation and were primarily intended for the UK - West Africa route, as existing flying boats could not travel this route without stopping in Lisbon. The sale made a small net profit for Pan Am - priced at cost plus 5% - and provided a vital communications link for Britain, but was politically controversial. In order to arrange the sale, the junior minister Harold Balfour had to agree to the contract with no government approval, leading to stern disapproval from Winston Churchill and lengthy debate by the Cabinet over the propriety of the purchase. Churchill later flew on the Bristol and Berwick, which he praised intensely, adding to the Clippers’ fame during the war. The last Pan Am 314 to be retired, the California Clipper NC18602, in 1946, had accumulated more than a million flight miles. Of the 12 Boeing 314 Clippers built three were lost to accidents, although only one of those resulted in fatalities: 24 passengers and crew aboard the Yankee Clipper NC18603 lost their lives in a landing accident at Cabo Ruivo Seaplane Base, in Lisbon, Portugal on February 22, 1943. Among that flight's passengers were prominent American author and war correspondent Benjamin Robertson, who was killed, and the American singer and film/TV actress Jane Froman, who was seriously injured. The 314 was been featured in the film Raiders of the Lost Ark, which actually used a Short Solent Mark III made to resemble a 314 by use of matte effects. ^ a b c d Follett, Ken (1991). "Author's Note". Night over water. New York: William Morrow and Company. p. 399. ISBN 0-688-04660-6. LCCN 91017701. ^ a b Bogash, Robert A. "In Search of an Icon: The Hunt for a Boeing B-314 Flying Boat, Pan American NC18601 - the Honolulu Clipper" rbogash.com. Retrieved: July 31, 2011. ^ Morris, Ted. "Air-Sea Rescue at Ocean Station Charlie: The Bibb & Bermuda Sky Queen." Archived July 3, 2010, at the Wayback Machine flyingboatmuseum.com. Retrieved: July 31, 2011. ^ Johnston, Jeff. "Project Update." Clipper Discovery Update: The UAS Chronicles of the Honolulu Clipper and Bermuda Sky Queen Discovery Project, Underwater Admiralty Sciences Newsletter, November 2005, pp. 1, 12. Retrieved: September 16, 2009. ^ Johnston, Jeff. "Project Update. "Clipper Discovery Update: The UAS Chronicles of the Honolulu Clipper and Bermuda Sky Queen Discovery Project, Newsletter, Underwater Admiralty Sciences, July 2007. pp. 1, 9. Retrieved: September 16, 2009. ^ Bartly, Nancy. "Archived copy". Archived from the original on 2014-06-07. Retrieved 2014-06-05. CS1 maint: Archived copy as title (link)Money sought to retrieve submerged Boeing Flying Clippers The Seattle Times, September 25, 2011. ^ "Foynes Flying Boat Museum." flyingboatmuseum.com. Retrieved: December 2, 2007. ^ Verschuere, Gilles. "The Making of Raiders of the Lost Ark: Concluding the Adventure." The Raider.Net, 2009. Retrieved: September 16, 2009.